It was in the month of July 2018 that I came to know about this organization MylocalDost. I had heard a lot about them through my colleagues and I was curious to explore the offbeat experience that these guys offer. 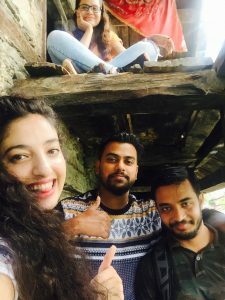 I spoke to Andrew, Founder of MylocalDost, and asked if I could experience something unconventional that they offer and also reminded that I will be travelling solo (victim of typical spoiler group). 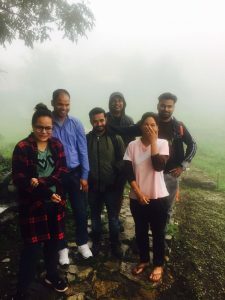 Coincidentally, Andrew informed that he and his team will be out on scouting a place called Raithal in Uttrakhand that they believe has the potential to host offbeat travel seekers. Honestly, it was the first time I had heard of this place. 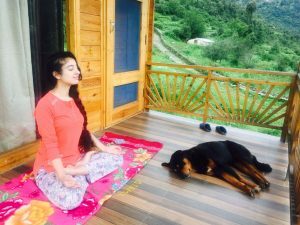 I had traveled before to Dehradun, Mussourie and Nainital, with my friends, and that were the only tourist places I knew in Uttarakhand. It really made me curious when Andrew shared about Raithal and trusting the reputation that MylocalDost carries, I just went for it without the second thought. I knew I was in for a new experience altogether from the moment we started our journey to Raithal in the car. 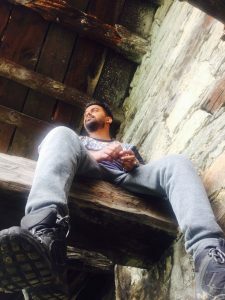 Throughout the road trip, we slowly observed the scenery and landscape changing, the mountains getting greener, the temperature dropping and watched the city slowly fade away from our sight. 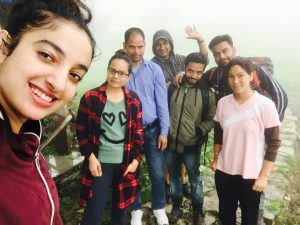 For me, it was an unexplainable twelve-hour drive on a perfect road and greenery all the way, something I had never experienced before and ofcourse a happening team to be with. 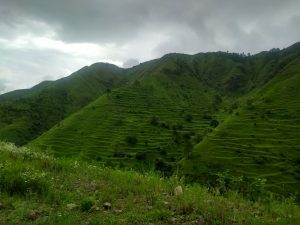 I could not believe that Uttarakhand could be so green; courtesy to the monsoons. 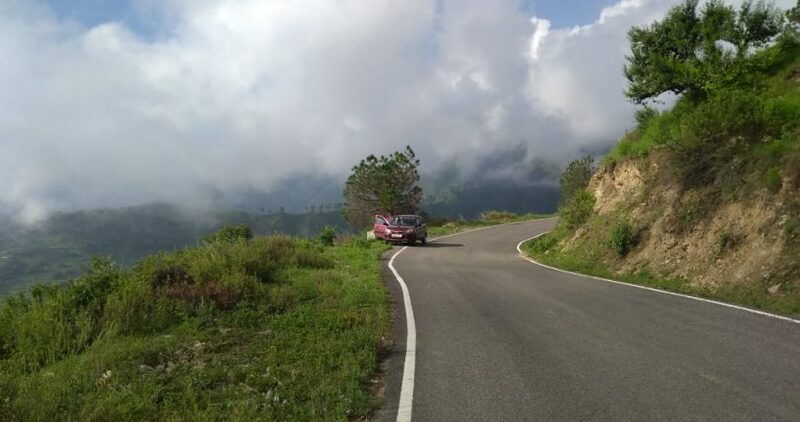 Also, it broke my myth of avoiding hills during the monsoons; if you haven’t tried going to the hills during the rains, you have certainly missed something in your life. 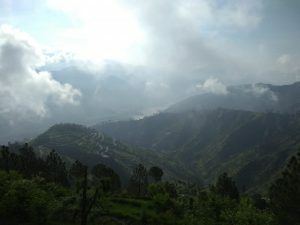 By-passing Mussoorie, crossing the famous town of Uttarkashi, we took an elevated road from Bhatwari to Raithal. Oh My God! The stretch from Bhatwari to Raithal – the last miles – were THE BEST part of the road trip. 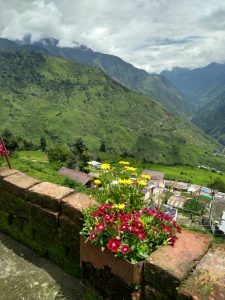 Lush green mountains with blooming white flowers, welcomed us and made us believe what a Fairyland could be. Words can’t express the sight it was. Finally, we reached Raithal and few showers welcomed us – icing on the cake. I just spread my arms as wide as I could to just feel the fresh air that we long for in our polluted cities. I do not know when was the last time I did something like this. 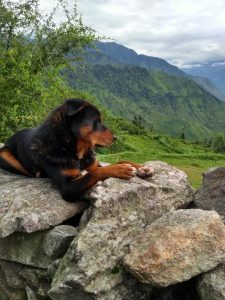 After reaching Raithal, the first person to welcome us was Kaalu (Pahadi Dog) and it just made my day. 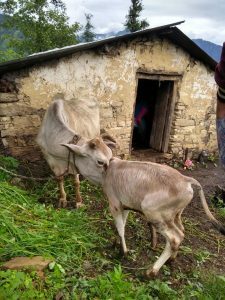 Kaalu literally guided us to the farmstay (where we were supposed to stay), which was one km trek from the main road of the Raithal village. 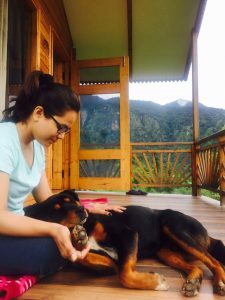 I was informed by the team that dogs are the best trekking companions and Kaalu was literally proving it. 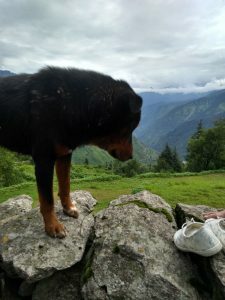 I had never seen such a gesture before by a dog which actually greeted and guided us. I was in love with him. 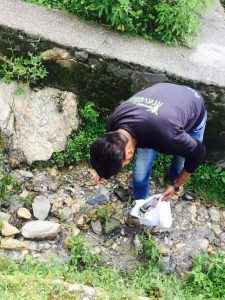 On our trek, we could see the plastic cans and packets dumped along the way, as it was also the trail to the Dayara Bugyal trek (famous amongst hikers). 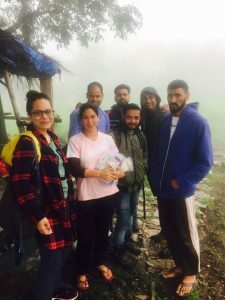 The MylocalDost team, after such a long journey and then a steep trek, was quick to attend to the plastic garbage that was hindering the beauty of the place and came trekking to the farmstay with a bag full of plastic. 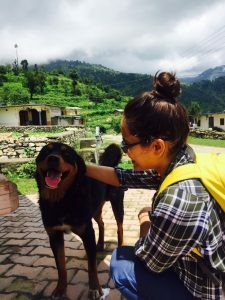 Finally, Kaalu took us to the farmstay, we met the local dost, Priyanka Rana, who was managing the farmstay on her own and thus, waving the women empowerment flag high. Apparently she is the princess of the Raithal village but to earn a living for herself she works at the homestay as the manager. She was supported by a local chef who was there at her disposal. 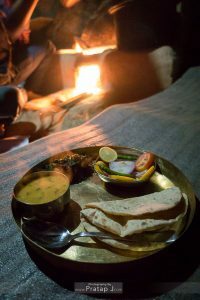 They welcomed us to their dining areas, which was a thatched roof and the very first thing that came to my mind that it looked like a Goan shack. A warm tea and cookies welcomed us and we were shown our cottages where the team would be staying. 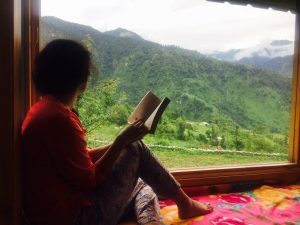 The view from the cottage was very serene, with white flowers in full bloom over the green meadow.And, the best part was the view of the Shrikhand Mahadev and Bandarpunch snow-clad peaks. These names, again I was hearing for the first time, but the moments were so beautifully captured in my brain, that now I remember all the names of peaks, villages, food, etc. J The room was made of wood which displayed the local architecture with large windows giving us spectacular views of the beauty around. 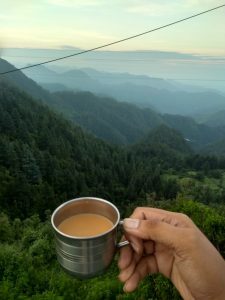 A lil’ balcony to sit out and sip hot tea/coffee and cherish the sounds of numerous birds and see the clouds passing by. Just loved it! 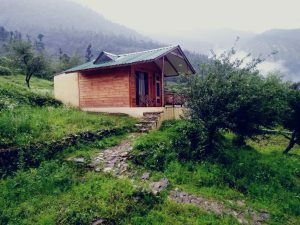 Such an offbeat location, mesmerizing views, so close to nature, authentic hospitality by the local dost (as MylocalDost says), and so non-touristy place/thing. So far, so Good, and so MylocalDost-kind-of-place. I asked for Gold and these guys gave me a Solitaire. And, my decision to come with them added more fun to the trip as I could see how MylocalDost works behind the curtains. And, they were the most interesting and funny people to be with, I was glad that my group ditched me and I could get a chance to be with these guys. Soon, a bell rang similar to what we have heard/seen in the schools of villages. I was expecting some children running out of some shed nearby but to my surprise, it was the call by the chef from the kitchen area for the lunch. That was really nostalgic and cool. 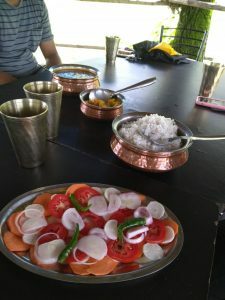 We all gathered at the dining area quickly for the one and only food as throughout our travelling, we skipped proper meals and enjoyed fruits and juices. Priyanka served us with Rajma, Chapati, Rice and a vegetable dish. It looked pretty usual meal but tasted really different. It wasn’t the same Rajma-Chawal that I have at home. And, curiously I asked Priyanka that what Rice or Chapati or Rajma was it. 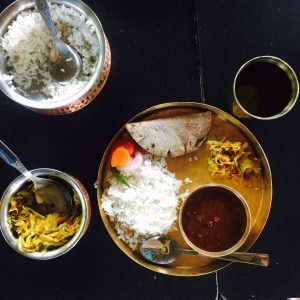 She explained that all of those were locally sourced and were known as Himalayan Rice and Harshil Rajma. I had heard a lot about local food through Andrew (who’s quite foody and is a non-veg lover) but was skeptical as to how would it taste whether my taste buds would be up for it or not. 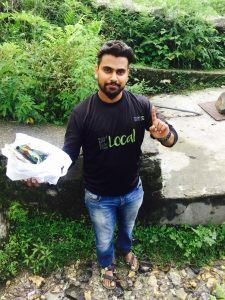 MylocalDost strongly promotes and includes local meals in the itinerary so that travellers get to taste the real flavor of the place and enjoy fresh-farm picked vegetables, which is next to impossible in cities. 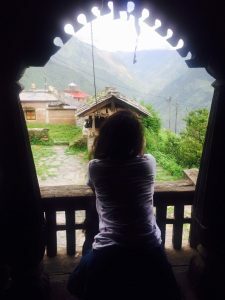 During the lunch, Priyanka asked us to drop our plan to go trekking to Dayara Bugyal the next day, as she was quite sure that the weather was not favorable. 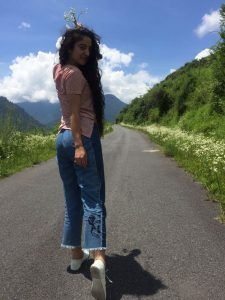 Instead she offered us to come and visit her 500-year old ancient home, which was also the home of the king of the village. Excited we were for the alternative. After the heavy lunch, we explored the entire farmstay on foot. 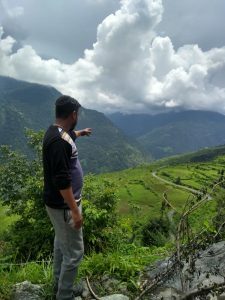 We met this particular person named Riptesh who was living in the same farmstay, in a dormitory though, who was almost 50 and has left his high-paying job and now works as a volunteer for promoting education and modern methods of farming among the local people. That sounded really crazy to me. But, when he shared his reason of choosing farming, to a great extent I agreed that humans have been going away from the Mother Earth, which has embraced us. We evolved humans, have no idea where our food is coming from, and our miles away from farming as we believe it’s a farmer’s job. And, now when we know how our farmers are treated in our country, we are very sure that farming is not what we are supposed to do. However, the reality is if you know how to produce your food, you would know why one should protect the Mother Earth. The interaction with that person was quite an eye-opener for youngsters like us who have no idea where our ground is. I went for a quick nap and meanwhile the MylocalDost team was at work. Soon, it started raining and became heavier but we enjoyed it while sipping tea in our balcony. It rained till late evening and our umbrellas were out and we kept strolling around to nearby homes and sheds. We went to one of the homes where an aunt offered us some light snacks and tea. We interacted with her and the team was taking inputs from her about the highs and lows of living here. She was a very kind lady and even asked for having the chullah dinner at her place. For a second, I wanted to say yes seeing her warmth nature and the chullah setup. But our dinner was already prepared by our chef and we disappointed her by saying so. Anyways, we promised her for next day morning tea and gupshup. Soon, we went for our dinner and surprisingly it was a chicken dish. I looked at Andrew and he gave a wicked smile. We wished for the bonfire but the rain never stopped and nor did our discussions. Finally went for a dead sleep after a very busy day. 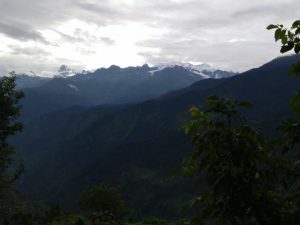 The next day, we woke up early to witness the sunrise, performed some yoga and the team was busy shooting the time-lapse video of the clouds over the Bugyal. 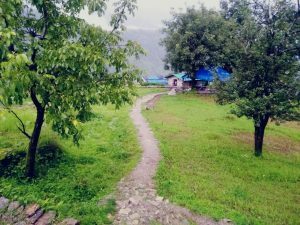 The weather was still cloudy but was clear enough to go for exploring the Raithal village and especially Priyanka’s ancient home – the Panchpura. We took to the streets of Raithal with our umbrellas on. Priyanka and Kaalu once again guided us to Panchpura. The walk through the village unravels women husking rice and making pickles and giving us a beautiful smile, children running through the narrow lanes, traditional architecture of the homes with beautiful wall paintings. The walk was simple but quite intriguing for me. It just made me realize that the locals (including Priyanka and team) here look so satisfied with whatever they have and are doing. They are so passionate about their village, people, landscape and most importantly their culture. Everybody in the village knows each other and come together for festivals, celebrations or any despair. This is completely missing in our cities, there’s so much to learn from the rural folks. 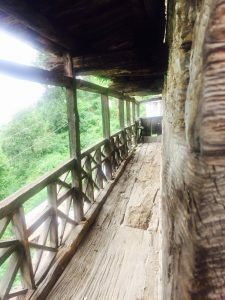 We finally reached the Panchpura – a very old wooden structure which looked like a three-storeyd building but actually had 5 storeys, hence Panch-pura. Priyanka is the descendant of the king who lived in this house. We could not figure out the entrance to this house as the doors were too small. Curiously we asked if her ancestors were shorter in size. To which Priyanka laughingly replied that the entrance is strategically designed and kept intentionally small so that when an enemy tried to enter the house, he had to bend down to enter and it gave the residents enough opportunity to smash his head. Wooooo…that was something! Also to our surprise, the house is completely earthquake resistant, no wonder it is still standing tall. What Genius our ancestors were! 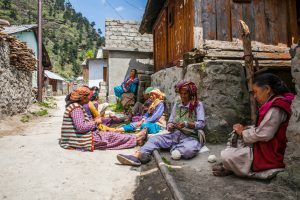 We also went around the village interacting with the locals about their lives, their aspirations, something which was a very humbling experience for me. The weather too was playing hide and seek with the rain and the sun, while the females of the village continued working in the fields at their own pace. 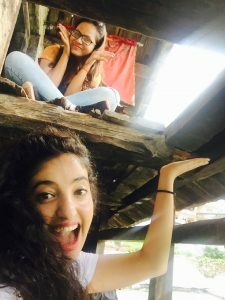 We then visited a beautiful local temple and the assembly area where locals celebrate each and every festival and Priyanka told us that almost every month they have a local festival and people from neighboring villages too come and participate. 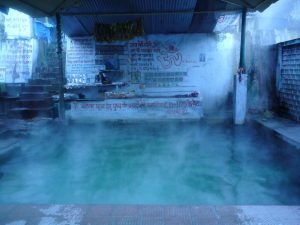 We then took a drive to Gangnani which is a natural source of hot Sulphur spring and one can take a dip and rejuvenate in the Rishikund. 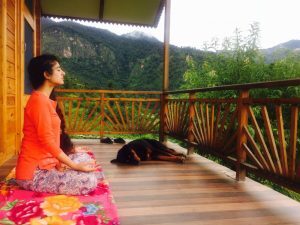 It was such a relieving experience especially after so much of walking and trekking. It was worth it as after the bath my skin started glowing. And, yes, there are separate kunds for ladies and gents. We met few Kawarias on our way back who were heading barefoot towards Gangotri (one of the char dhams) to take the holy water. We drove back to Raithal and it was dark by then. 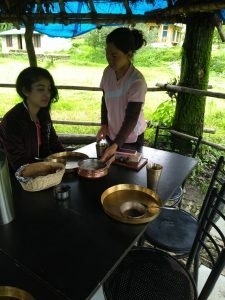 We were so tired that Priyanka recharged us with strong hot tea and our conversations continued. It was the last day at Raithal and we already started missing this place. We also had to sleep early as we had to leave early the next day.